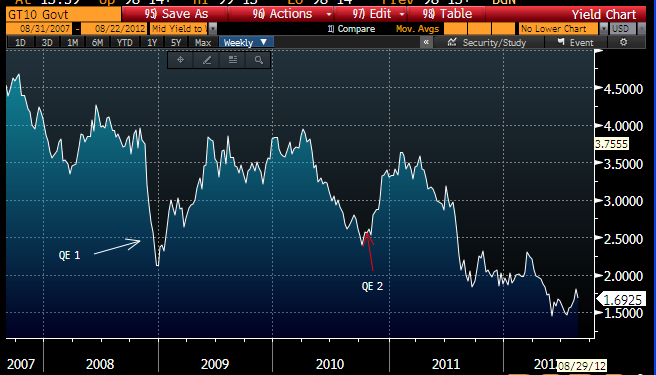 US treasuries have been in a 30 year bull market and have reached all time highs in 2012, with yields at all-time lows. Other major nation government bonds have hit similar levels. Considered net of inflation, bonds are at even greater extremes and are paying negative real returns. Fear has been the biggest driver of this excessive move into bonds. But by Gann methodology, their recent mid-2012 peak may mark the end of the secular bull. 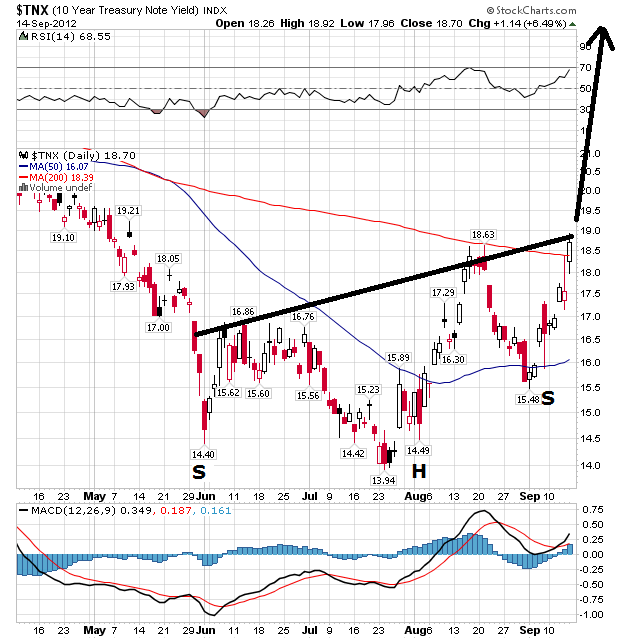 On the short term view, 10 year treasury yields have made an inverse head and shoulders formation, which should lead to yields breaking upwards and treasuries breaking downwards. 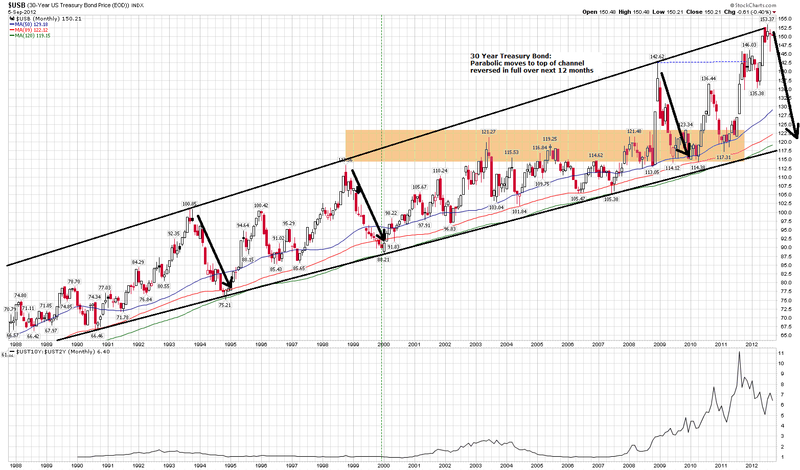 This is supported by a longer term view of 30 year treasuries, which shows that bonds made a recent parabolic move to the top of their long term channel, which historically led to treasuries falling sharply over the next 12 months. Interestingly, QE3 is open-ended, which could therefore provide the backdrop for treasuries to fall gradually, despite the Fed being a buyer in the market (as other buyers exit). 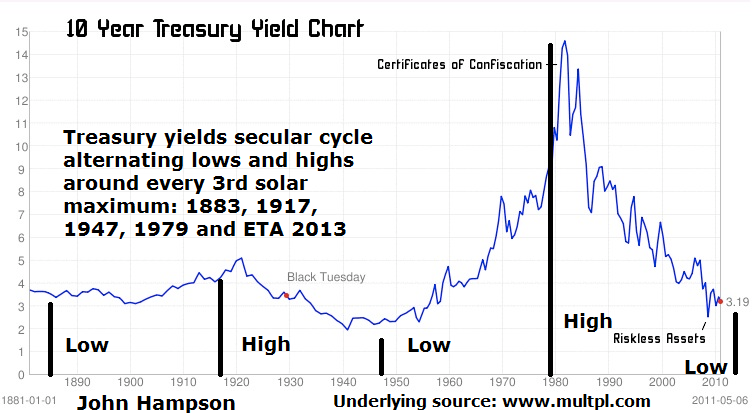 Taking the very long term view, treasuries have alternated secular highs and lows every 30 years or so, close to solar peaks. The next solar peak is 2013. 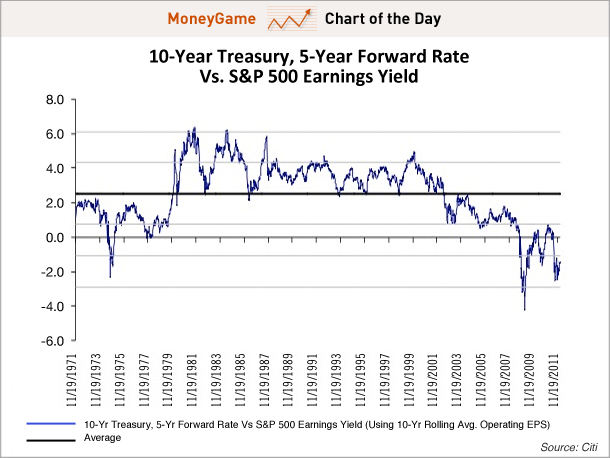 Not only are treasuries currently paying negative real yields, but the relative earnings yields of US equities is at a record. In other words, if confidence returns to equities there should be a large money flow from treasuries to equities in search of better yield. 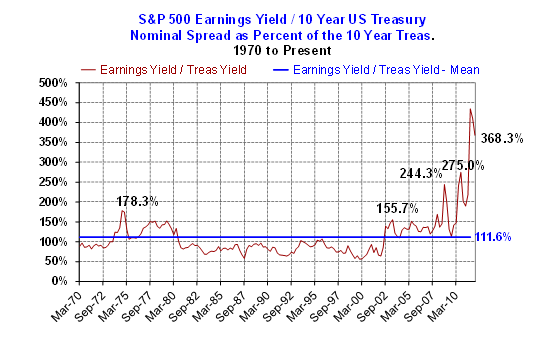 An alternative view of the same relations shows that earnings yields have reached a similar level of extreme attractiveness relative to bonds that previously marked a secular inversion (the end of the 1970s). 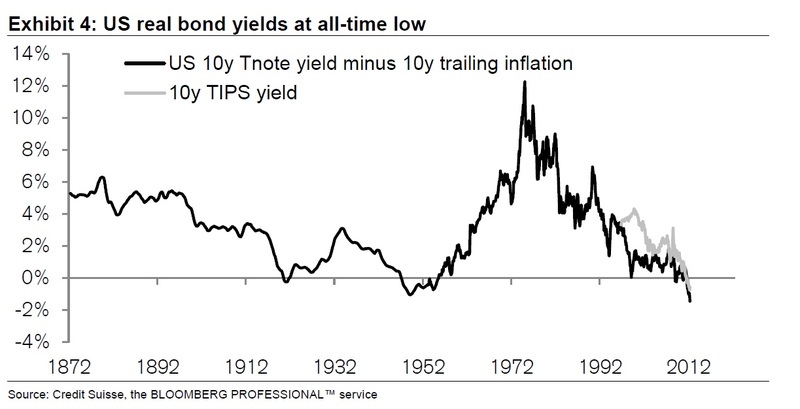 As 2013 should mark a secular shift from commodities and bonds to equities and real estate, as covered in the other parts of Forecast 2013, I believe now is the ideal time to position short treasuries (or long treasury yields), for a longer term hold. That concludes my 4-part forecast looking out to 2013. To summarise my overall approach, I am using a combination of solar cycling, secular cycling and historic repetition that allows me to forecast by time, i.e. a time range of what should happen when in different assets by aggregating the previous repetitions. I am cross-referencing this with technical indicators and fundamentals. Using technical indicators that have previously marked cyclical or secular inversions is also using history as a guide, whereas assessing fundamental developments is ensuring that history is still an appropriate guide in the current circumstances. The evidence generally suggests that we have seen a TYPICAL secular stocks bear and TYPICAL secular commodities bull since 2000 and that the guide of solar/secular and technical history is indeed appropriate today. If evidence were to start to mount that this were not the case then I would change my positioning and go cautious until it became clear what exception was occurring or what new rules were being written. Until then I am long commodities looking for a secular peak (by both time and technical indicators), long stocks looking for a cyclical peak (by both time and technical indicators), and short treasuries looking for a longer term secular hold. Considering the wider implications of cycles, historic repetition and rhyming, and technical indicators marking secular, cyclical or swing inversions in the same repeated manner (e.g. asset price ratios at certain levels, sentiment indicators at certain levels, yield curve shape, parabolic price action, breadth divergence and so on), it reveals a welcome limit to randomness in the markets. As traders we can use that non-randomness to obtain a predictive edge. For sure, there is a degree of self-fulfilling prophesy in that market participants seek order and in so doing apply a degree of order to the markets. However, nature is full of cycles and repetitions, and humans and their systems are very much of nature, therefore the absence of natural cycles and mirrors in time would be more shocking than their presence, in both the financial markets and economy. My own personal approach has been this: if there is both compelling evidence AND scientific reasoning, then I can forgo a degree of free will and embrace the likes of sunspots and geomagnetism. 2013 will be a significant validator – or otherwise – of solar’s role in the markets and economy. This chart shows that from 1995 to 1999 Stocks outperformed Commodities. From 1999 to 2003 Commodities outperformed Stocks. Since 2003 Stocks and commodities has almost indentical track. Next chart shows that last 6 months commodities has lagged compared to SP-500. Actually, if you use Continuous Commodity Index (CCI), then commodities have been outperforming stocks since middle of 1999 (with only a few corrections along the way). Currently stocks have outperformed commodities, but it is only a slight outperformance over the last few quarters. If John is correct and commodities go parabolic, the ratio in the chart I presented above, could go back to 1980’s lows. It is my opinion that CRB Index is not the best way to follow Commodities in general. The point regarding commodities and stocks being on identical track since 2003 is therefore incorrect, especially if one uses CCI (equal weighting of all commodities). Another way to view this, is to track S&P 500 priced in Gold (real money). S&P 500 has been in a major downtrend against Gold since middle of 1999. Once again, if John is right and PMs go parabolic, I could make an assumption that S&P 500 will be priced accordingly towards its 1980s low. Under that scenario, an investor might be able to buy the whole S&P 500 index for one quarter of an Gold ounce or even less. Or as some die hard Gold bugs are predicting, it might be possible to see 1:1 ratio against the Dow Jones. There is a slight difference when you use CCi instead of CRB. Thank you for all these articles, I read them carefully. I must say that my trading style is far away from yours, I trade technically and ‘fundamentals’, beliefs as to unfolding scenarios don’t play any part in it. I trade the markets as they are; stay away from dull markets, go with the momentum in fast moves, fade reactions in choppier trends. I read your articles because they may play a role in my other financial decisions – what to do with excess capital. I would like to ask you a question. I’ve learned from your comments that you use spread betting brokers. Aren’t you afraid that they may disallow long positions before commodities reach its final stage, as it was the case with FX brokers and gold/silver positions in 2011? They are market makers and before they go bankrupt they may use the authorities to ban these positions, using ‘evil speculators and profiteers’ propaganda. Hi there. The 2011 restriction was on leveraged gold/silver trades in the US only, due to the Dodd Frank legislation. Unleveraged trades, ETFs were still OK, and everywhere else in the world unaffected. I’m in the UK and I just can’t see all those means of trading PMs being closed here so that there is nothing open to me. If it were to happen, then gold and silver would have already gone manic. I don’t intend to stay until the end of mania – the reward may large, but the risk too. So some kind of intervention once things have gone too crazy in PMs wouldn’t be a problem.